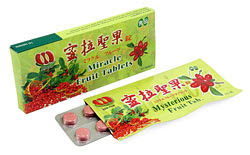 I’ve been wanting to post about the miracle fruit for the longest time but wasn’t sure where you could find it in Hong Kong but now I’ve discovered that you can buy the tablets on ThinkGeek and ship them to Hong Kong so I think it’s time I do the post. I first encountered this West African fruit when I was in Tokyo at the famed Tapas Bar at the Mandarin Oriental Tokyo. As a venue that only has seven seats for its degustation molecular cuisine menu, I had to book two months in advance. The miracle fruit was the last item on the menu and it really took the cake. Prior to trying the berry, we were given a plate of lemons, grapefruit, limes etc. In the interest of science, I licked the fruit and the sourness definitely had me puckering my mouth. I pop the miracle berry in the mouth, chew it and then was told to try the fruit again. Imagine my surprise as the extreme sweetness that filled my mouth. I was able to literally chomp down a lemon and it was saccharine sweet. The effect lasted for about 30 minutes and was definitely a pleasant surprise. Give it a try if you’re feeling adventurous. My only question is, where does ThinkGeek source their miracle tablets from? With Chinese on its packaging, is it also commonly available in Hong Kong and I am just behind the times? 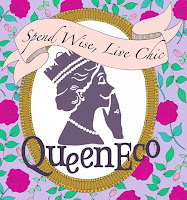 Geek Spy: Duck or egg first? Geek Spy: Is that road kill under my door?